ChaN has published a pretty amazing generic FAT file system - as he says FatFs is a generic FAT file system module for small embedded systems. 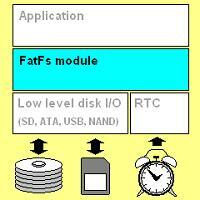 The FatFs is written in compliance with ANSI C and completely separated from the disk I/O layer. Therefore it is independent of hardware architecture. It can be incorporated into low cost microcontrollers, such as AVR, 8051, PIC, ARM, Z80, 68k and etc..., without any change. Here are a few (unessential) tweaks that I use with the CodeVisionAVR V2 compiler. These notes apply to the current (6-79-2011) version of FsFAT (R0.09) and CodeVisionAVR (V2.05.3a). They only cover changes to the ff.h and ff.c files as the other files are highly dependant on the hardware you use. You don't have to change the file delimiters if the original names suits your file structure. You don't have to use the char promotion additions if you are compiling the project with promotion on. However, be warned that FsFAT MUST be compiled with promotion on for some of the fat arithmetic to produce the correct results. I have only tested these changes in a limited fashion - for example I have not used long filenames. However, I have used the module with CodeVisionAVR with some pretty large projects (by my standards) with complete success. The FatFs module is not mine - all credit and honour goes to ChaN.